Wind power and the grid. Plans for the future of the Grid. At the beginning of this century, we in Ireland faced problems in our electricity market. We did not have enough efficient electricity plants to enable the growth of our economy, there was a need to integrate the markets and infrastructure of the Republic and Northern Ireland, the EU required competition in the electricity market and wind energy was beginning to come on stream in quantity and needed to be integrated into the grid and market. The Irish market is a pool type market, all generation is sold into the market pool, the costs are added and the retailers buy from the pool. The wholesale electricity market in Ireland is operated by an organisation called SEMO and is regulated by the CER, but the grid itself is operated by Eirgrid. To encourage renewable energy onto the grid, certain tariffs were introduced for different forms of renewable energy, for wind energy the tariff is called REFIT, under REFIT the Energy Regulator annually decides on an amount of money to put into a fund to pay REFIT. Under the REFIT tariff a floor price is decided for wind energy, currently 6.7c a unit. However, as there is also a ceiling on the amount of money in the pot (the annual amount set by the Energy Regulator). If the total wind energy produced exceeds a certain limit, then the REFIT tariff ceases to be paid and instead the wind farm is paid the spot marginal price on the day. A different tariff applies to wave, tidal and hydro although the same mechanism applies. Every day the market operator SEMO issues its projected demand for the following day and asks the generator’s to bid their marginal cost and availability for half hourly blocks of generation capacity. The operator then checks the wind forecast to estimate the contribution from wind farms and then assign’s those blocks to the cheapest generators available. 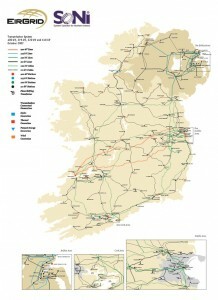 SEMO then pass this theoretically cheapest dispatch plan to EirGrid. EirGrid carry out the planned dispatch making adjustments in real time for demand, grid congestion and unexpected event’s. And the books are balanced on the third day according to the results of EirGrid’s adjustments to the theoretical plan. Thats when such things as constraint and ancillary payments are decided. A coal station like Moneypoint takes many hours to come online, a combined cycle gas turbine CCGT plant takes 1 or 2 hours, an open cycle gas turbine OCGT takes about 15 minutes. Generally, the faster a thermal plant can come online, the less efficient it is, meaning its electricity will be more expensive. However, they are usually cheaper to build than non-thermal plants. Hydro electricity is different; it can come online in seconds and is very efficient. Wind has priority dispatch: which means that energy produced by wind generators is allowed onto the grid ahead of other means of generation – except in the case that this would cause technical or safety problems for the grid. It is easy to see from the above that an efficient, capable and flexible grid is vital to the economics of our electricity supply. The Grid infrastructure on the island of Ireland is owned and maintained by ESB Networks and operated on a day to day basis by EirGrid. The ESB began to build the electricity grid at the same time as Ardnacrusha was being built. 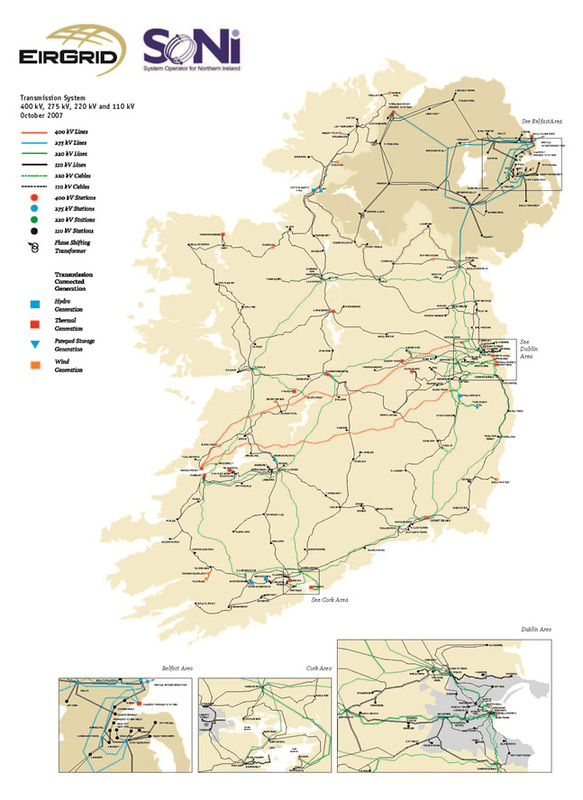 Ireland’s first transmission line was built between Ardnacrusha and Dublin in 1930, which liked up with the first part of the distribution grid which was built around the then outskirts of the city. The grid today comprises of two types of networks, transmission lines which carry very large amounts of electricity long distances connecting power stations to local transformer stations and local distribution grids which carry electricity from the transformer stations into individual consumers’ premises. As a general rule, the transmission grid is carried on large metal pylons or wooden portal frames, two high poles with a connecting metal crossbar on the top and it operates at very high voltages. The distribution grid is carried on single wooden poles and uses lower voltages. In towns and cities the distribution grid is sometimes placed underground. However, it is extremely expensive to build underground AC transmission lines and the technology is at a very early stage of development. The red lines are the ‘motorways’, the green lines are ‘dual carriageways’ and the black lines are ‘main roads’. The Irish government’s plan to reinforce the grid is called Grid25. The Grid is paid for by the standing charges on a domestic or small business electricity bill, larger users pay a higher charge and generators pay for sending their produce to the market, these charges are called Tuos and Duos charges (the T is for ‘transmission’ and the D is for ‘distribution’). A smaller wind farm might be connected to the distribution grid and the electricity largely consumed locally, in this case the wind farm would only pay Duos charges or, if it is a micro project it might even qualify for a simple standing charge. The intent of the legislation is clear, i.e. to provide for the dispatch of renewable generators ahead of conventional generation with only security of supply considerations justifying any derogation from that duty.